Barcadere Marina, George Town (Commercial) Once a desolate, misused North Sound backwater just east of George Town, the Barcadere Marina is a modern maritime community centre with a strong Caymanian cultural resonance. Although executed in a contextual vernacular influenced by local, Jamaican and Floridian historical architectural elements, the marina development deploys contemporary materials specification and construction techniques that successfully reinterpret historically significant regional architectural styles whilst creating a technically proficient and sustainable precinct that remains sensitive to local scale and environment. Developer – The Barcadere Marina Ltd. Consulting Engineers – APEC Consulting Engineers Ltd., MEGA Systems, HNGS Consulting Engineers Ltd., Arch Engineering, Patrick Broderick & Co. Surveyors. Project Management – BCQS Ltd. Contractors – Arch & Godfrey, Phoenix Group, Benchmark Construction, VW Marine Engineering. Seagrape House is exemplary of a sustainable and storm-resistant residence that successfully responds to a tropical climate, preserves the natural environment, and respects the built heritage of the Cayman Islands, whilst employing traditional construction techniques in addition to exploiting cutting-edge renewable energy technologies. Its internal spaces and exterior elevations are reminiscent of 19th century Caribbean Great Houses, including Grand Cayman’s Pedro St James. Verandahs on all sides provide shade, access to and from interior rooms and a pleasant stroll amongst the treetops of the overhanging sea grape trees. This house represents a comprehensive approach to integrating renewable energy sources, luxury accommodation, with an architectural style that suits its environment. Judge’s comment. Consultants – CE+S Partners (structural), Jeff Demme Geothermals (renewable energy), Mega Systems Ltd (renewable energy), Arista Engineering Ltd (mechanical, electrical and plumbing), Vigoro Nursery Ltd (landscaping). “Living lightly on the planet” is the goal of Cayman’s first eco-development, which uses green technologies to minimise its impact on natural resources and the environment, whilst creating an environmentally friendly, responsible and sustainable home for home owners and vacationers alike. Set in a rugged iron-shore landscape on the North West Point of Grand Cayman, Lighthouse Point is surrounded by indigenous flora and fauna. An invocation of early Caribbean architectural references, complemented by antique anchors, cannon and other nautical references, and some innovative 21st Century eco-technology, successfully reflects and reinterprets the culture of sustainability that defines Cayman’s maritime provenance. 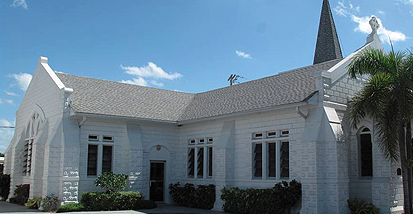 When completed in 1922, Elmslie Memorial Church was the most impressive structure in the Cayman Islands. It was the largest and most complex building every built on the Islands and its builders, being Master Shipwrights, had to adapt to the use of reinforced concrete and blockwork as it was the first time these materials were used in the Cayman Islands. The Master Builders had to work out new methods of construction and design a roof that is not only beautiful, but also a well engineered structure that has stood up against many hurricanes over the years including Hurricane Ivan. It is in perfect condition at this time and the whole building is a national treasure. This building when completed was a construction marvel, the pride of the Presbyterian Church and the people of the Cayman Islands. It was proof that Master Shipbuilders were able to become Master Builders. It stands today as a memorial to its owners, architect and builders and to the spirit of a people who were able to achieve so much with so little. Camana Bay Town Centre The Town Centre at Camana Bay is an example of design excellence and inspiration for more sustainable development. The design successfully created pedestrian friendly, human scaled public spaces, taking into account sun and wind orientation through shading devises and building orientation. The Paseo has created the largest pedestrian only, dedicated outdoor public space in the Cayman Islands and has become the centre of arts and cultural events for the entire community. Construction needed to respond to the environment in many ways. One of the largest challenges during construction was the dewatering process. The design called for basement parking, which meant building below the water table. In response to this the construction team created a channel and used pumps to lower the water for construction. Most significantly, the entire Town Centre layout was designed to ensure that wind from the Harbour in the East would penetrate deep into all courtyards. Large openings facing into the wind were created and subsequent buildings were broken to allow air passage through the town. The input of the Town Centre to the Cayman economy is immeasurable. At its peak construction over 850 persons from over 45 companies were on site daily. The Town Centre has created a public space of extreme size and complexity to host many cultural events over the years to come. Contractors – Apec Consulting Engineers Ltd., DECCO Ltd., Flour Daniel Caribbean, Inc., McAlpine Ltd.